One of the hot trends in travel now is providing unique and personal experiences for people who are very interested in food. Of course we all are interested in food but if you consider yourself a “Foodie,” the world can be your oyster – or your truffle or your soufflé! You learn better when your own hands are involved. Just this week an operator visited our agency, telling us about the food and wine experiences of Provence which he can provide for our clients. (That’s you!) He showed us a picture of a truffle dug up on a truffle hunting trip; it was the size of a squashed baseball! Of course the next step after finding the delicacy is to offer it to a local chef with a star or two behind his name, for a demonstration/cooking lesson which produces your lunch. Many hotels and operators are offering such experiences now, usually with the involvement of a highly qualified chef who is also an entertaining teacher. If an area is known for a particular product (wine, cheese, cider, ham, whiskey, seafood) or a unique cuisine (Cordon Bleu or traditional), we can probably find an expert willing to involve guests in the experience. You can go to the local market or the kitchen garden with the chef to collect ingredients and then help to prepare lunch. You can tour the cellar, creamery or wharf, learning about what makes the local offerings so special. Of course consuming some of the specialty is always included. Without that it could hardly be a complete experience! Let me know what sort of savory experience you would most like to have; I will watch for it or even go on a search for you. Holland America has had Culinary Arts Centers (essentially kitchen theaters) on its ships for several years. 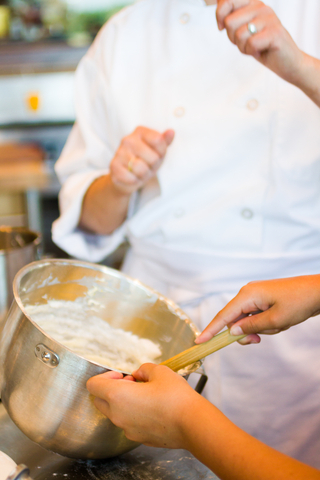 They feature big name chefs for demonstrations and small group presentations on various sailings. 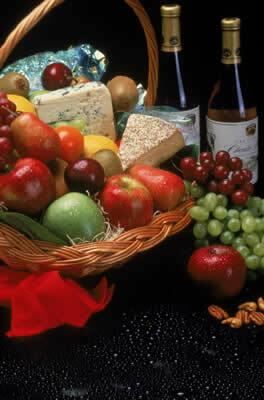 Enjoying cheese, wine, and produce in the region that made them is a special luxury. Now I see that Celebrity Cruises is adding a new twist to some of their sailings starting this summer. They are launching Top Chef at Sea, partnering with Bravo’s television show Top Chef and featuring some of the TV “chef-testants” in shipboard cook-offs and interactions with guests. If you prefer cooking as theater and competition, this would be the food experience to seek out. There are a multitude of cooking and dining experiences to be had as you travel. If you would like to build some of them into your next trip, let’s talk about it. I would love to make it happen for you. This entry was posted in Travel, Uncategorized and tagged cheese, chef, cooking lessons, cuisine, gourmet, travel, truffles, whiskey, wine. Bookmark the permalink.